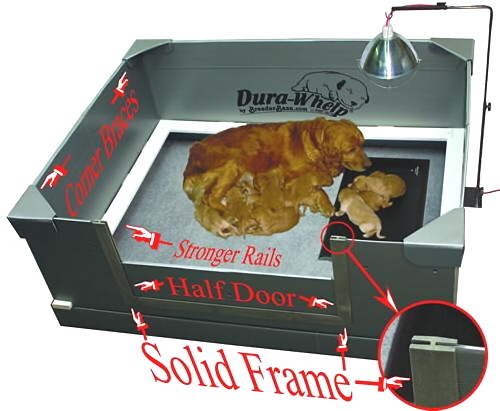 "Whelping Boxes" Dura-Whelp® the Original PROFESSIONAL whelping box. The worlds Cleanest & Easiest & Safest whelping boxes "since 1994"
Also, see what our customers have to say! The assembled Dura-Whelp® is easy to clean, light-weight and easily moved, our imitators' boxes come apart when lifted, ask them. The job of a Whelping-Box is to keep puppies clean, safe & contained. Our patented design allows for the rails to be completely suspended above the floor. This eliminates the possibility of puppies getting crushed under complicated rail supports/feet or stilts. 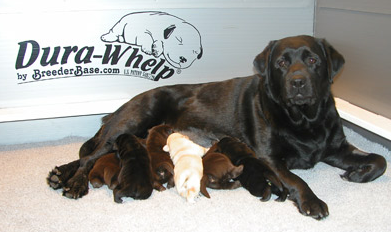 PUPPY RAILS are included with every whelping-box. If it doesn't have rails, it's not a Whelping-Box. Corrugated plastic is somewhat flexible yet extremely durable and easy to clean. Our patented floor-to-wall design eliminates parts with complicated slots, grooves and gaps for poop/urine to get trapped in & leak through. Our flat and open surface area allows for easy cleaning! Outdated wooden boxes are not only heavy but impossible to keep sanitary. Painting introduces diseases, skin lesions, etc. & the probability of puppies eating the paint. The entire Dura-Whelp® Box can be easily cleaned with Bleach, Quatricide, other detergent or disinfectant. Keeping a sanitary environment has never been easier! To disassemble and store the Dura-Whelp Box, simply reverse steps 1-2-3, and repack. Can easily be stored in a closet or under a bed. We understand that the construction of Corrugated Plastic resembles Corrugated Cardboard, however, Corrugated Plastic is NOT CARDBOARD. The Dura-Whelp® Box is made of top quality, extruded, polypropylene plastic. This plastic makes the Dura-Whelp® lightweight, strong, flexible, UPS shippable and easily cleanable. When it comes to performance (and cost), there is very little resemblance between Corrugated Plastic and Corrugated Cardboard. Small 34" x 34" x 15"
Medium 40" x 40" x 20"
Large 48" x 48" x 20"
Extra-Large 60" x 48" x 23"
What size is right for my breed? Back due to popular demand, an unnecessary finishing touch for your Dura-Whelp. Comes in a pack of four corners. 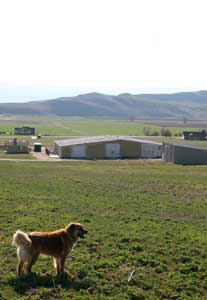 Many breeders requested a "half-door" option for the box. This door is designed for use with the new frame. Already included with all new Dura-Whelp boxes, same low price! This new door system is easy to use and WILL work with your existing box! The frame is a solid (one piece) "H" grooved Polypropylene that fits perfectly in the door opening. New doors are sized to accommodate this frame.